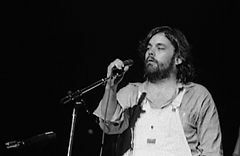 Lowell Thomas George (April 13, 1945 – June 29, 1979) was an American songwriter, multi-instrumentalist, and record producer, who was the primary guitarist, vocalist, and songwriter for the rock band Little Feat. George's first instrument was the harmonica. At the age of six he appeared on Ted Mack's Original Amateur Hour performing a duet with his older brother, Hampton. As a student at Hollywood High School (where he befriended Paul Barrere and future wife Elizabeth), he took up the flute in the school marching band and orchestra. He had already started to play Hampton's acoustic guitar at age 11, progressed to the electric guitar by his high school years, and later learned to play the saxophone, shakuhachi and sitar. During this period, George viewed the teen idol-oriented rock and roll of the era with contempt, instead favoring West Coast jazz and the soul jazz of Les McCann and Mose Allison. Following graduation in 1963, he briefly worked at a gas station (an experience that inspired such later songs as "Willin'") to support himself while studying art and art history at Los Angeles Valley College for two years. Initially funded by the sale of his grandfather's stock, George's first band The Factory formed in 1965 and released at least one single on the Uni Records label, "Smile, Let Your Life Begin" (co-written by George). Members included future Little Feat drummer Richie Hayward (who replaced Dallas Taylor in September 1966), Martin Kibbee (a.k.a. Fred Martin) who would later co-write several Little Feat songs with George (including "Dixie Chicken" and "Rock and Roll Doctor"), and Warren Klein on guitar. Frank Zappa produced two tracks for the band, but they were not released until 1993 on the album Lightning-Rod Man, credited to Lowell George and The Factory. The band made an appearance on the 1960s sitcom F Troop as "The Bedbugs". They were also featured in an episode of Gomer Pyle, U.S.M.C., "Lost, the Colonel's Daughter" (season 3, episode 27). They appeared in the scene inside the A-Go-Go club, with their music heard playing loudly. They received credits at the end of the episode as "'The Factory' Lowell-Warren-Martin-Rich, Courtesy of Universal Records". Following the disbanding of The Factory, George briefly joined The Standells. In November 1968, George joined Zappa's Mothers of Invention as rhythm guitarist and nominal lead vocalist; he can be heard on Weasels Ripped My Flesh, Burnt Weeny Sandwich, You Can't Do That on Stage Anymore, Vol. 1, You Can't Do That on Stage Anymore, Vol. 4 and the first disc of You Can't Do That on Stage Anymore, Vol. 5. During this period, he absorbed Zappa's autocratic leadership style and avant garde-influenced conceptual/procedural-oriented compositional methods. He earned his first production credit (in conjunction with Zappa and Russ Titelman) on Permanent Damage, an album recorded by "groupie group" The GTOs. George later asserted that "he performed no real function in the band" and left the group in May 1969 under nebulous circumstances. GTOs member Pamela Des Barres has claimed that George was fired by the abstemious Zappa for smoking marijuana, while he claimed at a 1975 Little Feat concert that he was fired because he "wrote a song ["Willin'"] about dope." On the other hand, biographer Mark Brend asserts that Zappa "liked the song" but "thought there was no place for it in the Mothers' set"; George himself alternatively claimed that "it was decided that I should leave and form a band" by mutual agreement. George also claimed to have played uncredited guitar on Hot Rats. After leaving the Mothers of Invention, George invited fellow musicians former Zappa bassist Roy Estrada, keyboardist Bill Payne and drummer Richie Hayward to form a new band, which they named Little Feat. George usually (but not always) played lead guitar and focused on slide guitar, but Ry Cooder played the slide on "Willin'" on the debut Little Feat album after George badly injured his hand while working on a powered model airplane, although George rerecorded some of his material and he played the rest of the slide work on the album. Mark Brend wrote that George's "use of compression defined his sound and gave him the means to play his extended melodic lines." George began his slide playing using the casing of a Sears, Roebuck and Co. 11/16ths spark plug socket wrench, rather than the traditional glass or steel finger tube. Little Feat signed to Warner Bros. Records through Zappa's efforts and their first album was Little Feat, produced by Russ Titelman, but it was not a commercial success and only sold 11,000 copies on initial release. The follow-up album Sailin' Shoes, produced by Ted Templeman, was the band's first record to feature cover artwork by Neon Park, but despite good reviews and an improvement on its predecessor, the album fared no better commercially. Estrada left the band in 1972 to join Captain Beefheart's Magic Band as well as to get away from the pollution in Los Angeles and he was replaced on bass by Kenny Gradney. In addition, Little Feat expanded to a sextet by adding a second guitarist Paul Barrere and percussionist Sam Clayton, thus cementing the classic line-up, and they took on a New Orleans funk direction with their next album Dixie Chicken, the first to be produced by George. By the spring of 1976, Little Feat were touring North America opening for The Who. Little Feat released several other studio albums in the 1970s, including: Feats Don't Fail Me Now, The Last Record Album, and Time Loves a Hero. The group's 1978 live album Waiting for Columbus became their best-selling album. Tensions within the group, especially between George and Payne and, to a lesser extent, Barrère, regarding musical direction and leadership led to Payne and Barrère's departure from the group in 1979 and the group's subsequent disbandment. 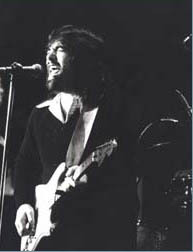 In an interview with Bill Flanagan conducted 11 days before his death, George stated that he was keen to re-form Little Feat without Payne and Barrère in order to reassert his full control over the group. George was also a producer, and produced the Grateful Dead's 1978 album Shakedown Street, as well as Little Feat's records and his own 1979 solo album Thanks, I'll Eat It Here; he also co-produced a couple of tracks on Valerie Carter's 1977 release Just A Stone's Throw Away. In 1977 he co-produced John Starling's debut solo album Long Time Gone. When not playing with Little Feat, George lent his talents as a session player to various artists, most frequently as a slide guitarist. He contributed to Barbara Keith's 1972 self-titled debut, John Cale's Paris 1919 (1973), Happy End's Happy End (1973), Bonnie Raitt's Takin' My Time (1973; "I Feel the Same" and "Guilty"), Harry Nilsson's Son of Schmilsson (1973; "Take 54"), James Taylor's Gorilla (1975; "Angry Blues"), The Meters' Rejuvenation (1974; "Just Kissed My Baby"), John Sebastian's Tarzana Kid (1974) and Jackson Browne's The Pretender (1976). Along with The Meters, George's slide work features prominently on Robert Palmer's first solo studio album, Sneakin' Sally Through the Alley, recorded in New Orleans in 1974. A year later, Palmer's second album (Pressure Drop) was effectively produced by George, and Little Feat served as the core band on the sessions. However, Palmer kept the producer's credit because of a dispute between Island Records and Warners. Later CDs list Steve Smith as producer. George led an overindulgent lifestyle of binge eating, alcoholism and speedballs (heroin and cocaine mixed together) and he became obese in the last years of his life, weighing 308 pounds. On June 15, 1979, George began a tour in support of his solo album, Thanks I'll Eat it Here. On June 29, 1979, the morning after an appearance at Washington, D.C.'s Lisner Auditorium where the bulk of Waiting for Columbus had been recorded, George collapsed and died of a heart attack in his Arlington, Virginia, hotel room at the Twin Bridges Marriott. His heart attack was caused by an accidental cocaine overdose. George's body was cremated in Washington, D.C., on August 2. His ashes were flown back to Los Angeles, where they were scattered from his fishing boat into the Pacific Ocean. According to Fred Tackett, "We were driving down the New Jersey Turnpike in this bus and we stopped at this pizza joint off the highway. Everybody in the band shared a cheese pizza but Lowell bought a large pizza with everything on it, carried it to the back of the bus, and he ate the entire pizza by himself. He died two or three days later. So, when people ask me, 'What really killed Lowell?' I say, 'It was a pizza on the New Jersey Turnpike.'" The song "Ride Like the Wind" on the 1979 self-titled debut album by Christopher Cross was dedicated to George. Jackson Browne memorialized George in his song "Of Missing Persons", on his 1980 album Hold Out. The song was dedicated to George's daughter Inara George, who is part of the musical duo The Bird and the Bee. Browne famously described George as "the Orson Welles of rock". Chris and Rich Robinson covered "Roll Um Easy" on their 2007 album Brothers of a Feather: Live at the Roxy. As well as covering "Willin" as a B-side for their Croweology acoustic double album. Arlen Roth recorded "Dixie Chicken" in tribute to George on his Slide Guitar Summit album with Lee Roy Parnell in 2013. Lowell met Susan Taylor (nickname Jonna) during his days with The Factory. Together they had Lowell's first child, Forrest George, in March 1969. George and his first wife Pattie Price had a son, Luke, in April 1970. They later divorced, and he became involved with Elizabeth Levy. Together he and Levy had a daughter, Inara Maryland George, in July 1974; the couple would marry in 1976. Inara is half of the musical duo The Bird and the Bee. Lowell was step-father to Elizabeth's son Jed Levy from her previous marriage to Tom Levy. George died June 29, 1979 just days before Inara's fifth birthday. ^ Tobler, John (1992). NME Rock 'N' Roll Years (1st ed.). London: Reed International Books Ltd. p. 283. CN 5585. ^ "Lowell George & The Factory – Lightning-Rod Man". Globalia.net. Retrieved August 23, 2014. ^ "Willin'". Little Feat Live at Auditorium Theatre. The Internet Archive. October 18, 1975. Retrieved December 22, 2012. ^ Neil Slaven (March 1, 2003). Electric Don Quixote. pp. 141–144. ISBN 978-0-7119-9436-2. ^ Clayson, Alan (February 2, 2004). "Brian Jones". Bobcat Books. Retrieved May 4, 2018 – via Google Books. ^ "Teenage Nervous Breakdown - Little Feat - Feb 14, 1976". Retrieved May 4, 2018. ^ "Little Feat - Little Feat - Songs, Reviews, Credits - AllMusic". AllMusic. Retrieved December 6, 2017. ^ "Dixie Chicken - Little Feat - Songs, Reviews, Credits - AllMusic". AllMusic. Retrieved December 6, 2017. ^ Strong, Martin C. (2000). The Great Rock Discography (5th ed.). Edinburgh: Mojo Books. ISBN 1-84195-017-3. ^ 'Written in My Soul' by Bill Flanagan ISBN 0-7119-2224-1 pp. 353-63. ^ Marios (October 5, 2013). "Rockasteria: Barbara Keith - Barbara Keith (1973 us, marvelous folk country rock, japan remaster)". Retrieved July 19, 2017. ^ Efram Turchick (January 22, 2002). "Interview with Leo Nocentelli". Sundazed.com. Archived from the original on July 25, 2008. Retrieved December 25, 2017. That's Lowell George playing slide on a song called 'Just Kissed My Baby' on Rejuvenation. ^ Kurt Loder (September 14, 1979). "Lowe-Carter rock wedding". Anchorage Daily News. ^ Forkes, Tim (November 22, 2015). "Lowell George and other thoughts". Los Angeles Post Examier. Archived from the original on March 10, 2017. Retrieved March 10, 2017. ^ "Remembering Lowell George". www.amoeba.com. June 29, 2009. Retrieved August 6, 2014. ^ "Little Feat: Waiting for Columbus". Allaboutjazz.com. Retrieved June 20, 2015. ^ Harrington, Richard; Harrington, Richard (August 7, 1988). "ONE GIANT STEP FOR LITTLE FEAT". Retrieved July 19, 2017 – via washingtonpost.com. ^ "Perfect Sound Forever: Lowell George- an appreciation". www.furious.com. Retrieved December 6, 2017. ^ "Deleted/Forwarding Page". Jrp-graphics.com. Archived from the original on March 3, 2014. Retrieved August 23, 2014. ^ Adam Sweeting (August 30, 2000). "The late, great Lowell George". The Guardian. Retrieved March 3, 2014. ^ Fong-Torres, Ben (November 12, 2013). "Willin': The Story of Little Feat". Da Capo Press. Retrieved December 6, 2017 – via Google Books. ^ "Lowell George's Little Feat Have Always Done Their Stuff, but Only Now Are They a Shoo-In – Vol. 9 No. 14". April 10, 1978. Retrieved July 19, 2017. This page was last edited on 14 April 2019, at 09:40 (UTC).